I had wrote this blog when I was campaigning to be on the Board of Supervisors. I wanted to be able to help our community at a deeper level. These statements still stand true for the situation in our township. There are secrets that were kept that are unforgivable. Many many issues and concerns have been brought to my attention since I became involved in fighting the warehouse proposal. Most of these concerns are not warehouse related. They are what caused me to sit up, pay attention and make the decision to run for Board of Supervisors. I can’t promise to solve all of them, but I can promise to listen, to open up a true dialog and forum that will allow the residents to voice their concerns, offer solutions, and do so without being bullied into silence, or told that it is someone else’s problem. If it’s in our township, it is our problem and it is our responsibility to solve it. We need to establish a Greenwich Township Constitution (see Pennsylvania Constitution) to ensure that the community is adequately represented in all things. Rumors are very wild in our township because we are not informed. We need to review our township zoning areas. Pennsylvania allows this to happen every five years. Many many MANY of the residents have asked to bring back the recycling. Victor says no, because of an issue with someone dumping bags of dog-poo in the recycling container. I say “YES” because we can prevent that with two simple steps. Individual issues that have been brought to my attention, have been discussed openly at Board of Supervisors meeting and the individual and their issue have been dismissed. In a couple cases, the individual had to spend hard earned money to prove their point to the township, a situation that never should happen. It the the responsibility of the township to investigate, review and document issues. That burden should never fall upon the community. Local farmers are telling me they have issues, however none of them have come forward with specific issues. I come from a farming family and I want them to come and talk to me. I understand the language, and the needs of a family farm. I want to be the people’s voice by first being their ears and listening. Through my own investigations (generated during the battle of the warehouse proposal) I found a very closed and secretive Board of Supervisors and Planning Commission. I asked questions to the BoS and the PC and all I received was fingers pointing to someone else for the answers. I investigated, found the answers and when I presented them to the BoS and PC, I was told that my investigations could not be accepted. Even though those investigations were documented by experts in their fields. The deeper I delved into the ordinances and the SALDO, the more I found they are sorely lacking for the society, growth and problems of the 2010’s. I reached out to the township engineers, Keystone Consulting, who refused to talk to me. So I hired engineers to answer my questions. I reached out to the township solicitor who never answered a single question and was very adept at redirection. So I hired two attorney’s to answer our questions. I will work this hard for the community and their issues. Whatever they may be, and I will always be forthcoming, open and honest with good communication while I investigate their issues. UPDATE: (10-30-17) A local farmer reached out to me about a concern they have. In 2013 they asked the township to help them. Their home is on one side of the road, their barn is on the other side. Both buildings are very close to the road. They want the traffic to SLOW DOWN. The township said there is nothing they can do, the road is already posted 40 mph. They said even 40 mph is too fast through that section of their buildings. My solution, which I have seen in other townships, is to install speed bumps with a sign that says, SLOW SPEED BUMP. Why can’t our township do that for them? I don’t know, but I will investigate! 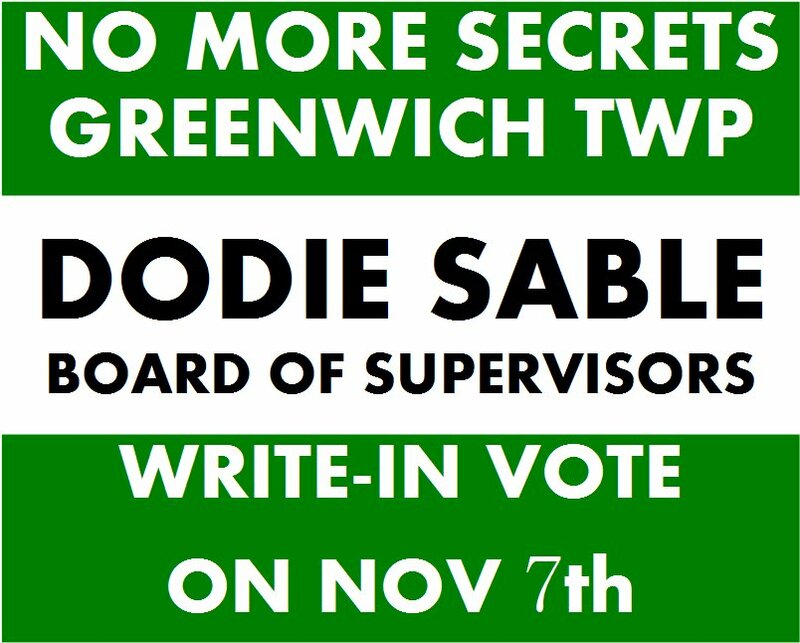 Tuesday November 7th is the day you can make your voice heard. Get out and vote for your township Supervisors. Two positions are open and I am running as a WRITE-IN against Alice Flyte for the two (2) year position. I have worked tirelessly for the past eight months researching all avenues to prevent a warehouse from being built just north of Krumsville on Route 737. Why is this so important to me? Because running warehouse traffic through that little five (5) point intersection is just insane, goes against all common sense and will cause severe safety issues for the residents in close proximity to the intersection and to the neighboring township residents who travel through that intersection on their way to and from work each day. During this past eight months, I have read hundreds of documents, studied dozens of manuals, and familiarized myself with the Second Class Township Code1 and Code2 books, the Pennsylvania Constitution and the Pennsylvania Zoning and Development laws. Yes, instead of reading a good “Who Done It” at night, I’ve been reading boring manuals. The rules do not need to be maintained, they need to be reviewed and updated to meet the requirements of a modern society, with all it’s modern needs. What exactly are you protecting, Alice? I watched you for the past eight months at the meetings and you have not once, NOT ONCE, stood up for the residents. I have heard you speak twice, in eight months, and in both cases your comments were to follow along. Not to question or stand up for the residents. CASE IN POINT! During the ambulance fiasco, when Dan Becker pretty much demanded that you all stop talking about it and make a decision, you only said this, “Well, the experts know best so we should do what they say.” I quote this directly from the recording of that meeting. WHAT??? Your residents were sitting in the audience, clearly speaking their mind that if something isn’t broken, don’t fix it. I heard numerous voices in the audience expressing their concerns over having a Lehigh County based ambulance service be responsible for getting into our township to rescue a resident. I heard numerous arguments from the Kutztown Ambulance service about the cross over from Berks County dispatch to Lehigh County dispatch and the issues that would arise, leaving time lost that could have been spent getting to a resident that needed rescued. WHEN DID YOU PROTECT THE INTEREST OF THOSE RESIDENTS? WHEN DID YOU DO THE RESEARCH ON AMBULANCE SERVICES ON YOUR OWN? WHEN DID YOU PROTECT THE INTEREST OF THAT RESIDENT? WHEN DID YOU DO THE RESEARCH INTO THE COSTS OF MAINTAINING THIS ROAD? Third case in point? Well, I have several blogs out here on the on-going warehouse project. I have spent hundreds of hours of my own time, thousands of dollars of my own money, researching, investigating, paying experts to document issues and find things that the township appointed engineering experts have missed, and have generally educated myself to the issues surrounding the current warehousing developments in our area so that I can speak intelligently about those concerns. I had to laugh when I heard you agree with the developer’s solicitor that part of having a warehouse in the community is accepting the traffic that comes with it. Harry stood up for the residents and stated that it was against common sense to put a warehouse in that location. YOU didn’t speak up for the residents. YOU took the side of the developer. And Alice? I do all this while working in and running a small business. I am not retired. I gladly sacrifice my free time to helping my community because I live here and I hear their voices loud and clear. I have been questioned on Facebook. What is your qualifications to be on the Board? What community services have you/do you perform? I want to be involved so that I can provide communication for our community. YAY (update 11-04-2017) Some questions for me! (From Kerry Berger on Facebook) Dodie- A few questions for you regarding your bid for township supervisor. 1-Are you a registered voter in Greenwich Township? If so, for how long? 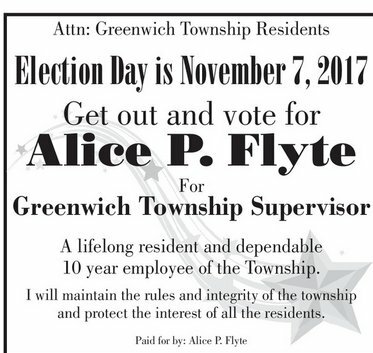 Also, what is your voting record for Greenwich Township supervisor in the past? 2-You stated in your blog that if you are elected you would hire a constable to enforce zoning/codes and a local police force – how do you intend to fund this endeavor? 3-As stated in your blog- you do not agree with your opponent’s (Alice Flyte) handling of the “ambulance fiasco”. What would you do to resolve the issue? 4- Since you are now familiar with the MPC, and realize each municipality may not have exclusionary zoning- I am curious as to where you feel the right location in Greenwich Township is for industrial zoning(i.e. warehouses). 5- You have stated that township should put speed bumps in front of residence to reduce the speed of traffic, because that resident has complained. I too, would like speed bumps in front of my house, as people continually speed past my home- putting my children and pets in extreme danger. As a supervisor, would you put speed bumps in for anyone who asks? Hi Kerry. Thank you for these questions, I will post these and my responses on that blog! (1) Yes, I am a registered voter since I was 18 years old. I am 55, so it is 37 years. Honestly, when I have voted in the past I (like many people) ran a quick check off without researching the candidates or finding out anything about our township and it’s needs. I have learned much over the past eight months about being involved in local government and I surely do wish I had learned this lesson years ago! (2) As I am not familiar with the budgets and finances of the township, I cannot answer this question at this time. (3) I was in attendance at most of the ambulance meetings. I was not privvy to the private meeting that was held. I would have done my own research, learned how the ambulance dispatching worked between counties, investigated the manner in which the ambulance corps setup annual service, talked to people in the township to get their opinions on adding/changing the manner in which they receive ambulance service and then I would have reviewed the information presented by the “experts” and used my own common sense judgment on the matter. (4) At this time I have not spent much research on our township and the current zoning areas. I do know that Pennsylvania allow for a zoning review every five (5) years and it’s quite possible the township should take the time to do that. Also, while we have to have Indurstrial zoning, we do not have to have warehouses! Yes, I have thoroughly investigated this, spoken with several different key people within the Pennsylvania and Berks County Zoning and it is very clear that while we have to allow for industrial land use, that use does NOT have to include warehousing. That was a very educational journey I was on! I do believe that our township has taken good steps in preventing future warehouses to go in – assuming that they never approve the special exceptions. (5) Hahahahaha … probably not. In the case of this resident. I took a drive to their property to see why they are so concerned with speeding. It is a farm on an “S” Curve with barns on both sides and the house is literally right on the road. To cross the road from house to barn, they’re in a blind spot to oncoming traffic from the south. To move livestock from one barn to the other, they are in a blind spot to oncoming traffic from the north. I got permission to speed through that curve and it is easy in a car to do 50 mph. Yes, I believe they need speed bumps at either end of this cluster of buildings. Do I think you need a speed bump at your home? No.